Who: North Hykeham Town Council. What: Resident engagement for a neighbourhood planning project. Result: The online platform attracted many useful comments and insight from residents to help the Town Council move forward with planning. In 2013, Hykeham Town Council launched an online engagement website on Stickyworld to support their efforts to invite early conversation between residents in North and South Hykeham in Lincolnshire. 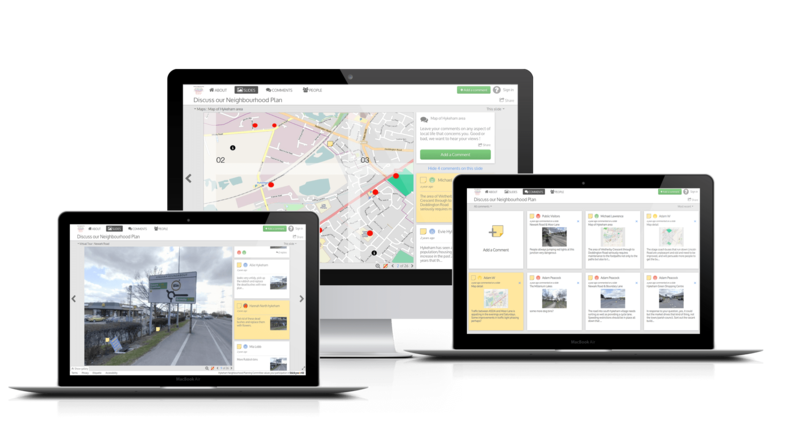 Their aim was to build an evidence base for their neighbourhood planning project and use Stickyworld's reporting tools to extract issues raised in the conversations to inform planning policy. A welcome video by Councillor Pete Dixon introduced the opportunity to get involved and have a say, encouraging conversations about the locality, and identify areas for change. Their online room combined a set of panorama images taken at 12 key locations, coupled with static maps extracted from Open Street Map. 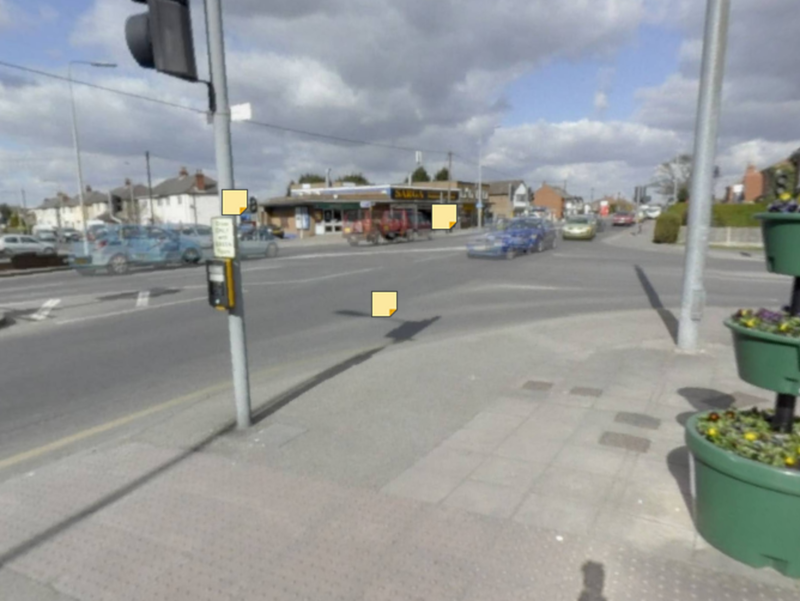 The panorama images were taken from locations where the neighbourhood planning team sought further conversation. An active team replying to comments meant everyone could better understand the opportunities and issues. 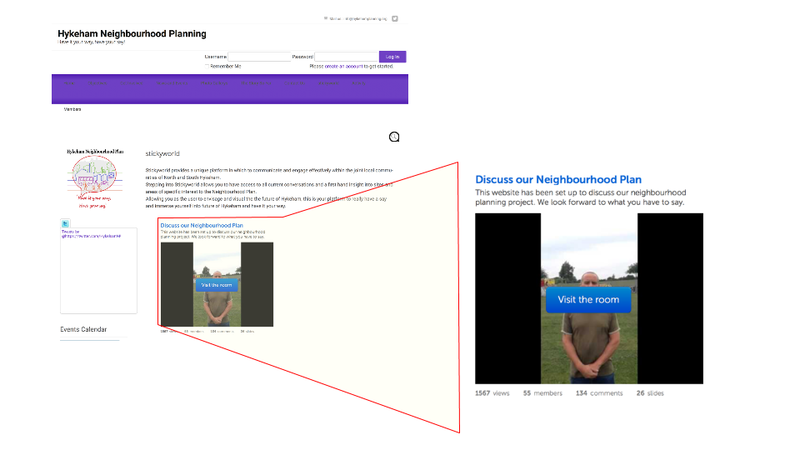 To promote their consultation, the council presented the site at face to face meetings, they went into local schools to present it, and they embedded the room in their website as shown below. The conversations on this project successfully connected young and old alike and enabled a richer more interactive online conversation for people to participate in at a time to suit them, valueable if they couldn't make the meetings. To see the room live, click on visit the room in the embed below.